Citation: Poswal A, K Jain. Graft Assisted Donor Closure. Skin Dis Skin Care. 2016, 1:2. Copyright: © 2016 Poswal A, et al. This is an open-access article distributed under the terms of the Creative Commons Attribution License, which permits unrestricted use, distribution, and reproduction in any medium, provided the original author and source are credited. Beard hair was transplanted into the scalp donor suture wound a few hours after the suturing was completed. Beard hair was used as it could be easily identified due to its differing characteristics. Thus, preventing chances of confusion. However, scalp hair or robust body hair can also be transplanted to achieve the Graft Assisted Donor closure. Follicular unit hair transplant is a widely used surgical treatment for androgenic alopecia . However, for patients undergoing FUT/FUHT procedures the scar following the strip donor closure is a cause of concern. This study aims to assess suitability of transplanting beard donor hair into the sutured scar on the day the suturing is done  (Figure 1). A study was commenced in May 2013 to examine: (1) The growth of hair transplanted soon after closing donor incision in a strip FUT procedure; (2) The amount of cosmetic improvement and any improvement in healing of the FUT donor wound. Figure 1: transplanting beard donor hair. In 23 male patients (having varying degrees of androgenic alopecia) during the FUT/FUHT procedure, beard donor hair was extracted by follicular unit extraction method using the Expanding Needle Concept , (under local anesthesia) and transplanted into a localized area of the sutured donor wound (Figure 2). Figure 2: sutured donor wound. Follow-up was carried out at various intervals (The transplanted beard hair were observed for growth, curl and caliber) . The scar was observed for its cosmetic appearance compared to the part where beard hair had not been transplanted. 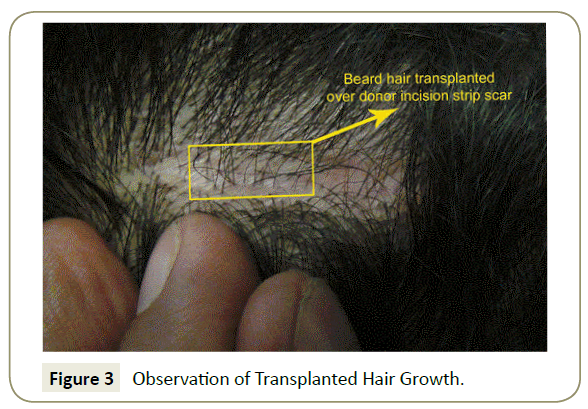 Figure 3: Observation of Transplanted Hair Growth. Scalp, body and beard hair can be transplanted shortly after strip donor closure and its gives better cosmetic result in the suture scar. These transplanted hair, however, do not change their colour, curl, and shaft diameter (caliber) (Figure 4). Figure 4: Beard Hair and Head Hair. Graft Assisted FUT Donor Closure in hair transplant surgery for better cosmesis Suture scar visibility in FUT is a disincentive for patients going for hair transplant. Use of trichophytic closure helps to get some hair growth through the FUT suture scar. However, that entails a reduction in number of grafts that can be excised in the strip (in simple words, a 1–2 mm narrower strip has to be excised). Body and beard hair have been known to grow when transplanted to the scalp. Use of beard or robust body hair to achieve the same objective (viz., better cosmesis for the healed strip FUT), helps maximize the size of the donor strip while at the same time keeping the scar less visible. The patient, 35 years old normotensive, non-diabetic approached our clinic. The patient wanted to go for hair restoration surgery. He had moderate hair loss (Norwood 3 level) progression to Norwood 4 level. On 27 May 2013, 2903 strip FUHT grafts were transplanted on the frontal area with marked hairline. We excised the strip from donor area by FUT/FUHT method. At the same time, 11 beard hair grafts were extracted by the stitchless FUSE/ FUE method (Figure 1) using the expanding needle concept . These beard grafts were transplanted into a specific part of the sutured strip donor wound approximately 4 h after the suturing (Figure 2). After 4 months, patient came back for follow up on 25th Sep 2013. 10 of the 11 beard hair that had been transplanted into the sutured strip donor wound were seen to be growing (Figure 3). They were recognizable from the scalp hair due to their different characteristics i.e., diameter, curl and sheen (Figure 4). 1. The sutured wound was less visible due to beard hair growth (Figure 3). 2. 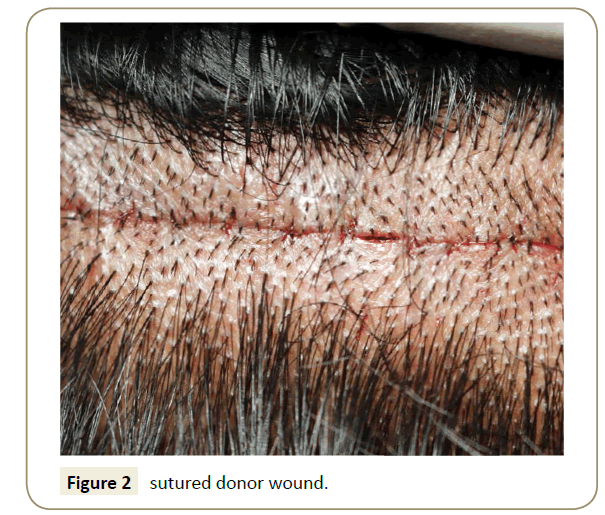 The strip donor wound (where the beard grafts were transplanted had less erythema) compared to the adjacent untreated suture wound (Figure 3). 1. Donor strip scar where grafts were transplanted (V1). 2. Body hair grafts were extracted using expanding needing concept (FUSE technique; V2) is attached for reference. VIDEO: Reference to Beard Hair Grafts Transplanted into Donor Strip Suture Wound. 1. Beard hair grafts can be used for transplantation into the suture line shortly after the FUT donor wound has been sutured. These hairs grow and provide cosmetic coverage reducing the strip scar visibility. 2. These transplanted beard hair, however, do not change their characteristics (i.e., diameter, curl and sheen). 3. Transplanting beard hair grafts into FUT suture line aids in better healing and reduced scar hypo-pigmentation. 4. Hair can be transplanted into the sutured strip wound on the same day and they grow in that location. Poswal A (2014)A comment on study of Donor Area in Follicular Unit Hair Transplantation.J Cutan Aesthet Surg 7: 68-69. Poswal A (2013) Use of body and beard donor hair in surgical treatment of androgenic alopecia. Indian J Plast Surg 46:117-20. Poswal A (2013)Expanding needle concept for better extraction of body hair grafts.Indian J Derma 58:40.